In his words, the so-called White Helmets were pressed by London in a period from April 3 to 6 to hurry up with the implementation of the planned provocation. "The White Helmets were told that in a period from April 3 to 6 Jaysh al-Islam militants would conduct a series of massive artillery bombings of Damascus. It would provoke a retaliation operation by government forces and the White Helmets were to use it to stage a provocation with an alleged use of chemical weapons," he said. According to Konashenkov, officers of the Russian defense ministry spoke with two Syrian who had taken part in filming the framed-up attack. Both have medical diplomas and work with the emergency department of Douma’s hospital. The two men do not conceal their names. They told Russian officers that all those who had been taken to hospital during the filming had no symptoms of exposure to toxic agents. "When the patients were receiving first aid unidentified people burst into the hospital, some were holding video cameras," the spokesman cited them as saying. "These people started shouting, fanning hysteria. They carried hose and douched all present with water crying out that all of them had been exposed to poisonous agents." "The patients and their relatives yielded to panic and began to pour water on each other. After this scene was caught on video, these unidentified people fled," he added. This is what is called evidence in the civilized world, he stressed, adding that Russia had repeatedly warned about provocations with the alleged use of chemical weapons against civilians plotted by militants in Eastern Ghouta. On April 10, the Syrian foreign ministry sent an official invitation to the Organization for the Prohibition of Chemical Weapons (OPCW) to visit Eastern Ghouta. 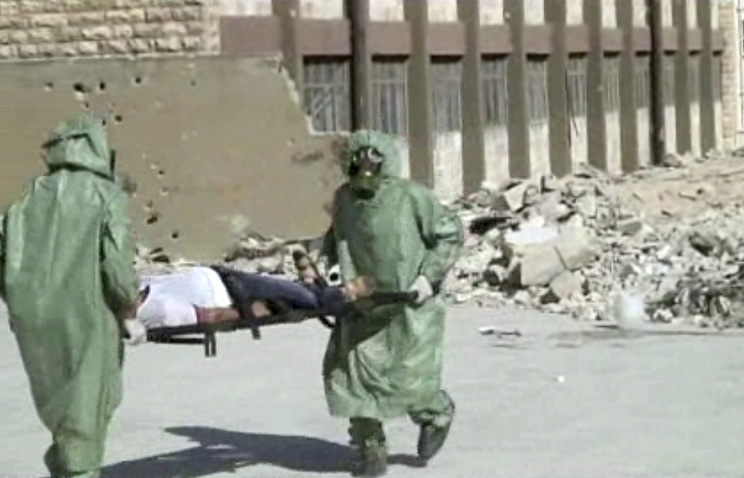 OPCW specialists are to arrive in Syria from Beirut on Friday.